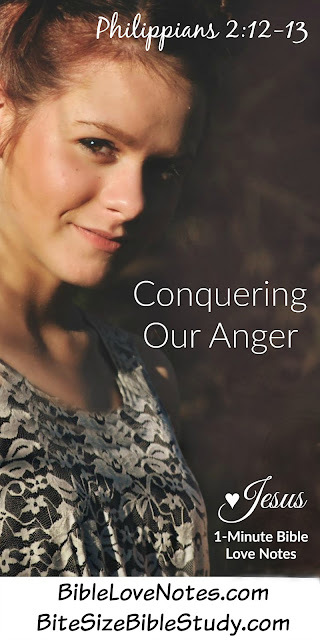 Bite Size Bible Study: Anger is a Serious Sin! The Bible Helps Us Overcome it. Anger is a Serious Sin! The Bible Helps Us Overcome it. Anger tends to be a common human problem, but it's a problem God wants us to overcome. 1. Ask God to give you His perspective on your anger or irritability. We should be deeply concerned about our anger, never justifying or excusing it (James 4:1-10). 2. Write down Bible passages that address anger and memorize or recite them daily, asking God to transform your mind and heart (Romans 12:1-2). Remember that God promises to change our will and our actions when we get serious about our sins (Philippians 2:12-13). The Bite Size Bible Study this week will help you take the two steps above. The following passages not only give you the Biblical perspective on anger, they also are great passages to copy onto cards so you can daily pray through them. 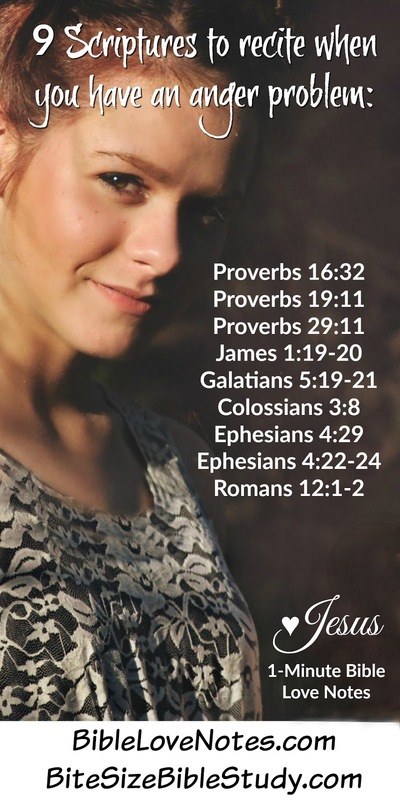 The benefit of reciting, memorizing and reading Scripture to overcome sin is discussed in this Bite Size study: I Can't Change! And be sure to read the insights for that study HERE. Galatians 5:19-21: The acts of the flesh are obvious: sexual immorality, impurity and debauchery; 20 idolatry and witchcraft; hatred, discord, jealousy, fits of rage, selfish ambition, dissensions, factions 21 and envy; drunkenness, orgies, and the like. I warn you, as I did before, that those who live like this will not inherit the kingdom of God. Colossians 3:8: But now is the time to get rid of anger, rage, malicious behavior, slander, and dirty language. Ephesians 4:22-24: You were taught, with regard to your former way of life, to put off your old self, which is being corrupted by its deceitful desires; 23 to be made new in the attitude of your minds; 24 and to put on the new self, created to be like God in true righteousness and holiness. These are so helpful. I am going to copy them and memorize them. Thank you Gail! Thank you! These are very helpful! God bless! Really it is a very satisfactory blog. Truely it will help to manage one's anger.